Sushi has long been one of my favorite foods, since I first had sushi in 1998 on a date junior year of college. As it would turn out, about four years ago, my husband actually proposed to me (with a personalized fortune cookie) the first time that we made our own sushi in our apartment in the Upper East Side. 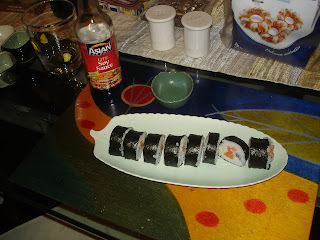 Since then, making sushi has always been a special tradition in our home. The key to making good sushi maki (rolls) is the quality of the fish that you start with. If you are not using fresh, high quality sushi grade fish, don't bother because you will be disappointed in the result. Further, given that I was making this at home with raw fish, I needed to feel comfortable that the fish market I was using was top notch and that there wouldn't be unpleasant repercussions. When we lived in Manhattan out fish source was Wild Edibles, in Murray Hill, which in my opinion is the best fish market in Manhattan, with the friendliest service. At the time that I shopped there, they had both sushi grade salmon and tuna for sale. I would still purchase all my fish there today, but for the fact that we moved to Park Slope in Brooklyn about a year and a half ago. Fortunately, we found a fish market here in Park Slope that might be even better, Ocean Market. Ocean market carries sushi grade salmon, tuna and yellowtail, and all are excellent. Plus, the prices are extremely reasonable and a huge drop from typical Manhattan fish prices. Yet the quality and selection of fish is much better than at virtually any Manhattan fish market. When you purchase fish for sushi, you do not need to buy a lot of fish. In the beginning, I always wound up with a lot of leftover fish. In total, about 8-10 oz of fish total is more than enough for two people, as you do not need to use a very large amount of sushi in the rolls (just a long strip) and the rice-component of the rolls is very filling. When you purchase the fish, you should have the fish market personnel thoroughly skin the fish for you and mention that you are making sushi, so they will direct you to the freshest (and most expensive, in all likelihood) sushi grade fish. Further, you may want to direct that they cut the fish in a certain part of the fish that has a fairly even thickness and texture (i.e. from the middle). 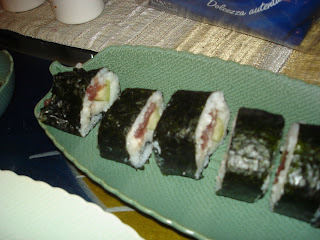 I have made four basic types of rolls that we have enjoyed - tuna, salmon, shrimp tempura (cooked) and yellowtail. I always enjoy making sushi rolls with my husband, as it is fun to do together and also great to do with friends, or to invite friends over to partake in homemade sushi. The first step is to make the rice. You must use special sushi rice, which is different from regular rice. I usually make about 2 cups, which is plenty for four people. First, the rice mush be carefully rinsed in cold water. The rice needs to be rinsed over and over (for about 10 minutes or so) until the cold water that you are using to rinse it runs clear. Put the rice in a saucepan (2 cups) and add 2 1/2 cups of cold water and heat until boiling. Cover and simmer like you would ordinarily cook rice, and do not lift the lid during the simmering process. While the rice is cooking, I prepare a sauce in a saute pan of 3 T of sushi rice vinegar, 1 T of sugar and 1/2 tsp salt. This is then mixed with the prepared rice, once it has cooled. You can alter this recipe a bit to taste, but this is a pretty standard recipe. Once mixed, the rice is fairly sticky. For the next step, you will need to purchase a sushi rolling mat (about $4)and of course some nori, which is the black seaweed paper used for rolling sushi. It is very tricky to explain in writing how to roll the sushi, but is is pretty easy to get the hang of it with a little bit of practice. Here are some instructions that may help a bit. Basically, place the nori on the mat the long way. Spread the rice on the surface of the nori, fairly thin (but thick enough to evenly cover the nori) about 1/4 of an inch thick. Whne you are spreading the rice, you should make sure the shiny side of the nori is facing down. Only spread the rice about 2/3 to 3/4 of the way to the top of the nori, leaving the top portion without any rice spread on it. Then cut a strip of your favorite fish and place horizontally across the roll. You may also want to add other ingredients - a mixture of wasabi and mayonnaise is perfect to make a spicy tuna or salmon roll and we usually add either avocado or cucumber. If you want to make shrimp tempura rolls, you should shell and de-vein the shrimp and then coat in egg and panko breadcrumbs, before frying it. Then you can put pieces of the shrimp tempura inside your roll. I have also made delicious rolls using two kinds of fish. 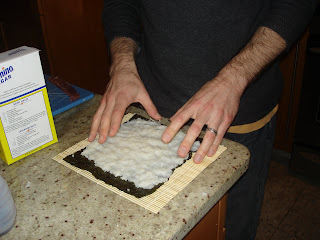 The next step is to roll into one long roll using the sushi mat, by folding the mat over and tucking the nori's end. Use the mat to squeeze the sushi roll once you have rolled it into a log and you can modify the shape with your fingers. Next, place on a cutting board and use a sharp knife to cut off the ends. Cut the roll in half and cut into about 6-8 sushi sized pieces. I would suggest purchasing some nice sushi plates for serving the sushi (we have several sets), and making sure to have plenty of wasabi and soy sauce handy. As always, if you have questions, comments or suggestions, please comment and one of our writers will get back to you shortly.